With the abundance of cartridge conversions of EA5 games, that in practice just load the game from ROM space into the 32k expansion RAM, I felt the need to make a consumer oriented 32k expansion. I started this back in July 2016. Functionally equivalent to TI's 32k expansion ram. It plugs into the sideport of the TI with an edge card connector. It runs off of +5v, using about 5-10mah. There is one configuration jumper to either take power from external 5.5/2.1mm tip-positive power jack, or the TI-99/4A sideport. With this a user can run many of the games on the 2048k cart or any of the 6 multicart games cartridges. Many of the newer cartridge titles also require a 32k expansion and will work with this device. IC SOCKET 28 PIN 0.6"
3 pins of 2.54mm male headers - same as above, break off a few. The TI-99/4A speech synthesizer does not pass power on pin #1. However, the 32k memory expansion may be connected to the right of the speech synthesizer and draw power if the power is jumpered across from pin #1 on the left to pin #1 on the right. Unlike TI sideport devices, this 32k device does not provide an edge connector on the right. 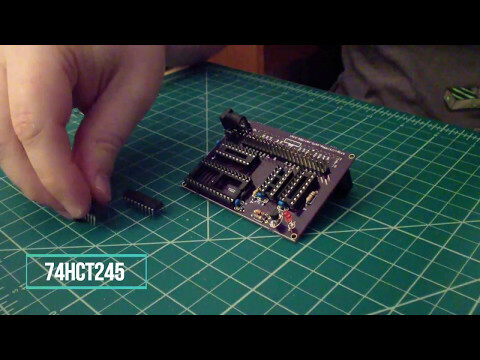 Instead the expected expansion mechanism is to use stackable headers for daughter boards, such as are common in the Arduino community. No such expansions exist at this time. The pinout is one for one identical to the sideport of the 4A, except that if using external power, pin #1 passes the external power through. The one difference, is that anyone should feel free to expand on this platform.